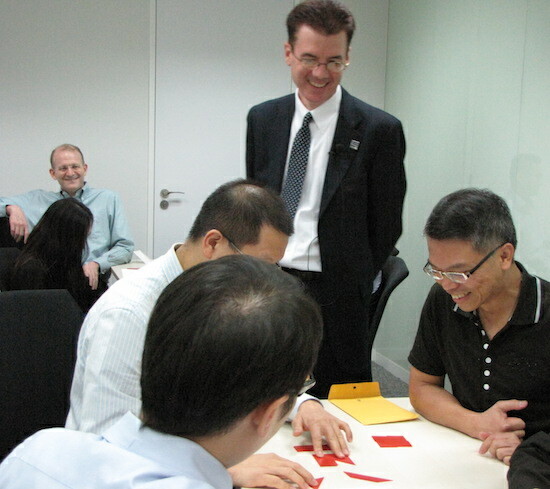 Red Squares exercize at the 2 1/2 Deming Seminar in Hong Kong (2014). As a speaker or coach or teacher it is wise to learn what impacts how people absorb information and learn. Factoring those ideas into how you communicate (one on one, coaching, training, presenting…) is wise. Learning about how people learn and remember is important to allow you to communite well. And most people seem to understand this. But they also seem to have no shame in not improving their performance in relation to these common weaknesses. I have never understood why so many people talk about weaknesses in how people learn (people only remember “10% of what they hear, 20% of what they read, and 80% of what they see and do”; you must repeat something 7,9,12… times before most people will remember it; people will retain more if they are given concrete examples relevant to them; people will remember more if they speak or write than if they just passively listen; a good visual will make an idea presented much more likely to be remembered…) but never seem to seek to improve their weaknesses in these areas. Yes, it is harder for us to retain new information when we just hear about it or if good information is presented poorly. But if you do a much better job of learning and succeed in retaining what you hear or see (even if often people fail to do this well) you will be better off. Yet what I see is people spouting these statistics, not as a way of learning what they need to improve themselves but as a way of explaining that it is inevitable and they won’t do any better (or even bother to attempt to do so). It just isn’t true that you can’t do better. You can train yourself to learn more than most people when the material is presented in a less than perfect manner by learning how we commonly fail to learn and making efforts to do better yourself. Sure, learn these common traits to know how you need to take them into account when communicating with others. But also examine yourself and see if you have the same weaknesses and improve in those areas you are weak. Also you can learn from them how to be more successful in retaining good ideas (write them down, think about applying them in your context, make a note to actually apply them at work tomorrow or next week…). You can blame whoever was communicating the ideas to you for failing to present it as well as they should but that won’t help you learn more. Also companies would be wise to put more effort into helping people learn better. I see lots of focus on how presenters should do better, but very little on how people can improve their capacity to listen and learn. Yes, those presenting should continually seek to improve and be aware of their customers (those they are communicating with). Those that are learning should also seek to improve their ability to learn, even if the way material is presented isn’t optimal. By the way, you might also want to question much of the claims of what people remember: Mythical Retention Data & The Corrupted Cone. This entry was posted in Psychology and tagged communication, learning, Psychology, tips on March 3, 2016 by John Hunter. Just some quick ideas for Kanban whiteboard magnetic card options from a question I answered on Reddit. 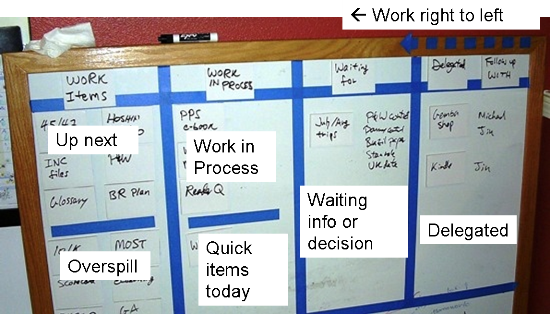 Here is the best lean solution: Trying Out My Agile Kanban Board from Jon Miller. Magnetic kanban board from Jon Miller. 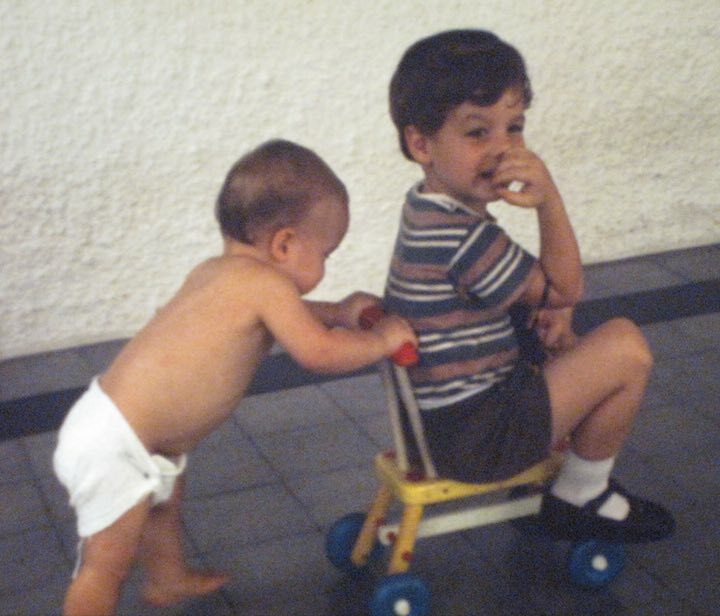 Why, well mainly I am kidding about it being the best, but if you don’t read his Gemba Panta Rei blog you should! Go add it to your RSS feed reader, before you continue with this post. Ok, welcome back. In addition to thinking his blog is great the solution from his blog is very flexible and easy – though it isn’t quite a packaged solution (as asked for on Reddit). Also that post provides some good insight into the thinking behind the board (as well as how to create your own). Another silly site, that sells some sort of solution, blocked my access because they don’t sell in the country my computer reported being located in. So I didn’t give them a free plug (assuming their product was decent which it might be?). Very dumb design if you ask me; well even though you didn’t ask, I told you anyway. Localization that impedes users rather than helping them seems far far too common in my experience. Mapping (and related – find closest…) uses are about the only localization stuff I find useful – country based localization I nearly always find annoying or crippling. And showing my location on a map is totally awesome (especially as I travel around as a tourist – or really in whatever capacity). Such bad design and poor usability decisions cost companies money. This entry was posted in Lean thinking, Quality tools and tagged agile management, kanban, lean manufacturing, productivity, project management, Quality tools, tips, usability, visual management on September 2, 2014 by John Hunter. 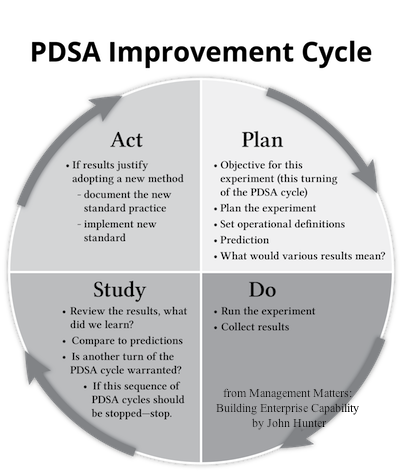 Using the PDSA cycle (plan-do-study-act) well is critical to building a effective management system. This post provides some resources to help use the improvement cycle well. This entry was posted in Deming, Management, Process improvement, Quality tools and tagged continual improvement, Deming, evidence based management, experiments, online resources, PDSA, Process improvement, Quality tools, tips on October 28, 2013 by John Hunter. Essentially, I think it is often sensible to break out email addresses for specific functions or processes. Then the email address can just be routed to whoever is suppose to handle those emails. And as your responsibilities shift a bit, those you no longer do can be shifted to someone else and you start getting your new emails. Another nice (I think so anyway) side affect is your various roles are made more concrete. Often it seems who really is responsible is unclear, if you have 5 email address that Jane handled before she left it will be obvious if only 4 of them have been reassigned that 1 has not. Granted such a thing should be obvious without this email tip-off but given how many organizations really operate failing to assign all of someone’s responsibilities to someone when they leave is more common than you would hope. It is also nice because, if their is a reason it is helpful, those emails can automatically go to as many people as desired. Also if the manager goes on vacation for 2 weeks, the emails can be sent also to the person filling in for them until they return. Another benefit is a manager, or whoever, can take a quick dip into the email traffic to get a sense of what is being requested. Another benefit (depending on the way it is implemented) can be to have all the software_testing_manager@ emails and responses associated with that email so if you are given that responsibility you can view historical response. If our knowledge management (wikis, or whatever) solutions were great this would be less important (though still probably valuable) but often the email history may have the best record of our organization knowledge on a topic. When it is spread about in a bunch of individuals mail boxes it is often essentially lost. It is a small think but this bit of process thinking I have found helpful. This entry was posted in IT, Process improvement and tagged communication, internet, Process improvement, tips on October 18, 2012 by John Hunter. Customer Focus is at the core of a well managed company. Sadly many companies fail to serve their customers well. To serve customers, a thorough understanding of what problem you solve for customers is needed. The decisions at many companies, unfortunately, are far removed from this understanding. It is hard to imagine, as you are forced to wind your way through the processes many companies squeeze you through that they have paid any attention to what it is like to be a customer of their processes. When you see companies that have put some effort into customer focus it is startling how refreshing it is (which is a sad statement for how poorly many companies are doing). If the decision makers in a company are not experiencing the company’s products and services as a customer would that is a big weakness. You need to correct that or put a great amount of energy into overcoming that problems. Another critical area of customer focus is to know how your customers use your products. It isn’t enough to know how you want your products to be used. Or to know the problems you intended people to use your products for. You need to know how people are actually using them. You need to know what they love, what they expect, what they hate, and what they wish for. This knowledge can help offset experiencing the products and services yourselves (in some cases getting that experience can be quite difficult – in which case you need to put extra effort into learning the actual experience of your customers). You cannot rely on what people tell you in surveys. You need to have a deep understanding of customers use of the products. Innovation springs from this deep understanding and your expertise in the practice of delivering services and building products. One of my favorite improvement tips is to: ask customers what 1 thing could we do better. It is very simple and gives you an easy way to capture what customers really care about. You shouldn’t rely only on this, but it is an extremely powerful tactic to use to aid continual improvement (with customer focus). This entry was posted in Customer focus, Deming, Management and tagged continual improvement, Customer focus, leadership, management, Systems thinking, tips on July 9, 2012 by John Hunter. The better job you do of managing the easier your job becomes. As a manager your primary responsibility is to improve the system: both the systems within your sphere of control and those outside of it. The more effectively you do so, the less firefighting you have to do. The less firefighting the less hectic and chaotic your days are. And the more time you have to focus on improving the system. The better you are at leveraging your efforts, the greater your impact, and more quickly your job gets easier. Most effective leveraging involves improving the system. Improvement to the system continue to deliver benefits continuously. A specific form improving the system is coaching people so they are able to be more effective at improving the system themselves. One valuable role you can play is to help avoid the existing traps that prevent improvements. Early in a transformation to a continual improvement culture there are significant barriers to improvements. Those not only prevent the system from improving rapidly they can easily derail the motivation people have to improve. It is hard to maintain a desire to improve if every effort to do so feels like a long slog through quicksand. As you create a system where people have the knowledge, drive and freedom to improve you get to enjoy continual improvement without any direct action by you. As this happens you are able to spend more time thinking and learning and less time reacting. That time allows you to find key leverage points to continue the progress on improving the management system. This entry was posted in Management, quote, Systems thinking and tagged coaching, curiouscat, leadership, management, managers, quote, Systems thinking, tips on June 25, 2012 by John Hunter.